Sprint 7 is completed, and the new build is published: (Check out the live demo). DONE 1) buildings are remembered between sessions. DONE 2) buildings have prices, that are taken from your available funds. 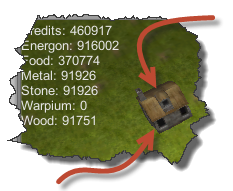 DONE 3) buildings gain resources by having them. DONE 4) your initial gains in the account will disappear and depend on buildings now. DONE 5) On the site, it should have a "Report Error" link on the Live Demo page, so people can post errors, like the fact it doesn't appear to work in Firefox or Aurora. DONE - Texture for 1 or more buildings. So I'm quite pleased with the results. I would point out that the menu system is not really working any more though, and at some point in the near future we will need to switch to a HUD/UI. It will do for now, but even in the video, you can see that some text is starting to cross over each other. We don't start sprint 8 until Friday. Our target goals will be setting the mood, with music and lighting. Still discussing exactly what those plans are, but there will be an update on Friday.